Gluten-Free Molasses Cookies! Chewy, soft and sure to become your new go-to Christmas cookie! 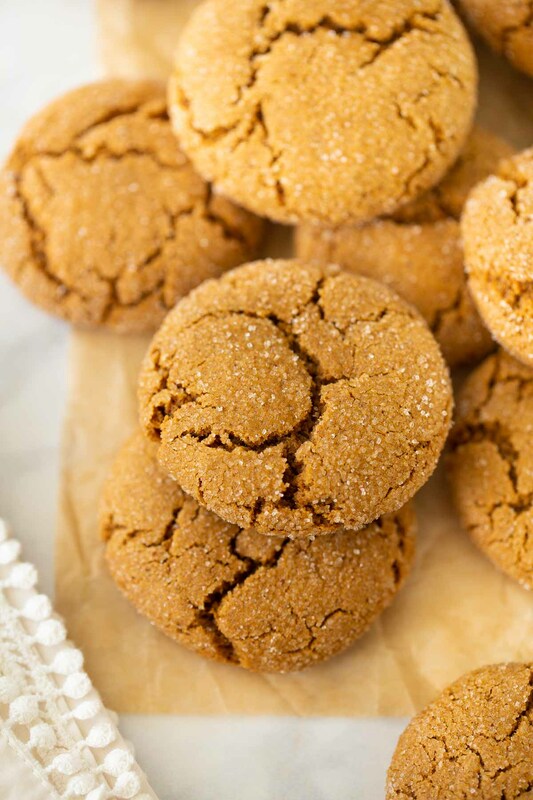 Soft Molasses Cookies. Molasses Crinkle Cookies. 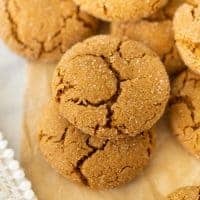 Soft Ginger Cookies. Whatever you call them – these cookies are sure to become your go-to Christmas cookie! These cookies are soft with the perfect amount of chew. They are spiced with ginger and coated in a festive sparkly sugar that gives them a delicious crunch. I’m usually a total chocolate girl – but I’m alway surprised how much I love these cookies! 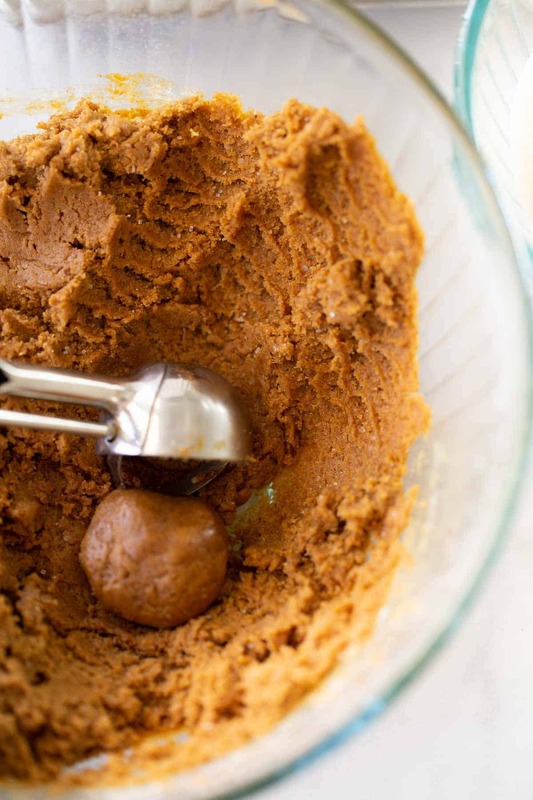 There are a few tricks to making perfectly soft, non-grainy gluten-free molasses cookies. The first is to add a secret ingredient – almond butter! 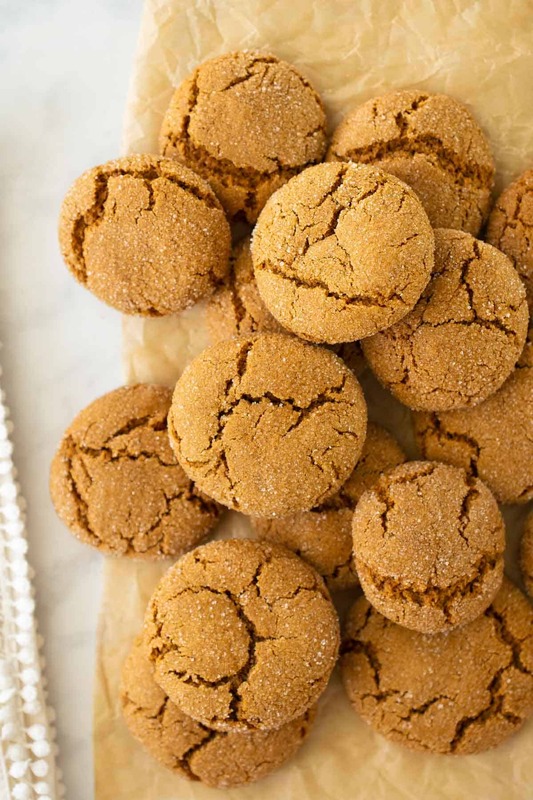 Almond butter is definitely not the first thing you think of when it comes to molasses cookies. But trust me! It’s the key to soft, chewy cookies in this recipe. A little almond butter adds structure, chew and richness. And don’t worry – you won’t even know it’s there. I’ve found that gluten-free flour tends to be a little denser than regular flour. When swapping it in for recipes it’s best to decrease the amount of flour slightly. 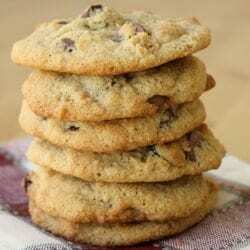 I originally tried this recipe with 1 1/2 cups gluten-free flour but found the cookies had a a much better consistency with 1 1/4 cups gluten-free flour. After you mix the dough together it’s important to give it a 1-hour rest. This gives the gluten-free flour time to hydrate and really makes a difference. It’s key for non-gritty gluten-free cookies! When you’re ready to bake, I like to scoop these cookies out using a cookie scoop then roll them in some cane sugar. Organic cane sugar works great for this since the texture is a little coarser. 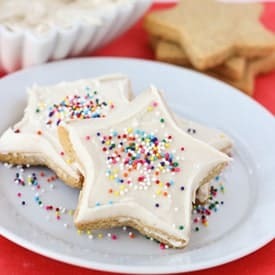 It gives the cookies a delicious crunch and festive sparkle! You can easily make these cookies dairy-free or refined-sugar-free if needed. Just use Earth Balance Buttery Sticks in place of the butter to make these dairy-free. 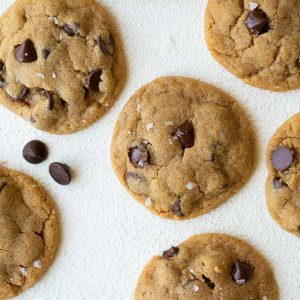 To make these cookies refined-sugar-free substitute coconut sugar for the brown sugar and skip rolling the dough in cane sugar. With all these tricks friends and family will never guess these cookies are gluten-free! They make a welcome addition to any Christmas cookie plate! Roll them in sugar: For extra crunch and a little holiday sparkle! 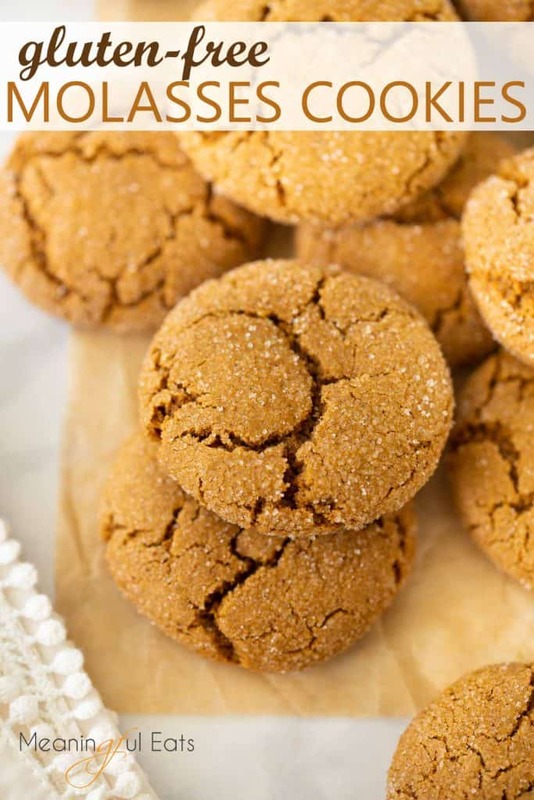 Perfect, chewy molasses cookies! The dough needs to be refrigerated for at least 1 hour before baking. Rolling these in a little sugar before baking gives the cookies a delicious crunch! In the bowl of a stand mixer, or in a large mixing bowl, mix together the egg, sugar, vanilla, almond butter, molasses, and butter until smooth and creamy. Add the remaining ingredients and mix thoroughly until combined. Cover and refrigerate the dough for at least 1 hour. Preheat the oven to 350F. Place about 1/2 cup of sugar in a bowl, if using. 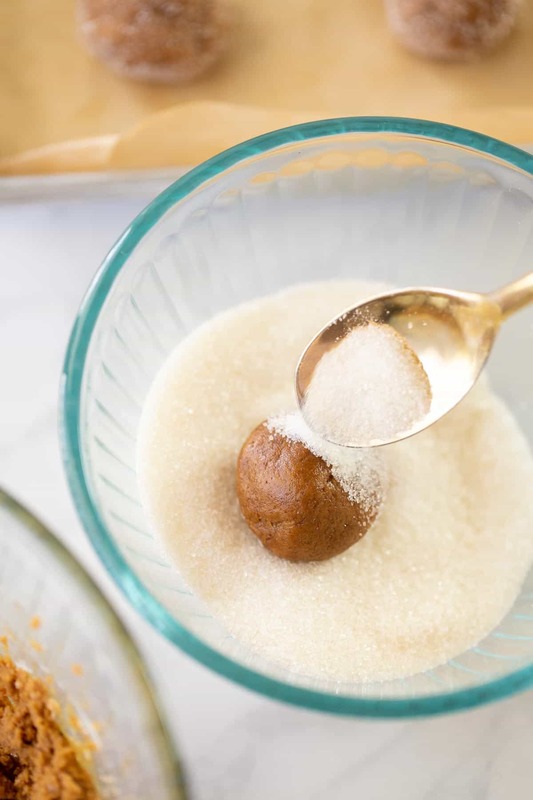 Scoop out 1-2 tablespoon-sized balls of dough and roll in the sugar. Place on a baking sheet. Bake for 9-11 minutes, until the edges are golden and the center has set. Cool on the pan for 2-3 minutes before moving to a wire rack to cool completely. Enjoy! *Make these dairy-free: Use Earth Balance Buttery Sticks in place of the butter. *Make these refined-sugar-free: Use coconut sugar in place of the brown sugar and skip rolling the cookies in sugar. These cookies are the best! Definitely one of my favorites. I buy it at Costco! They also usually have it in regular grocery stores by the peanut butter. You can substitute peanut butter or sunflower seed butter. How many cookies did you get from this recipe? This makes about 2 dozen cookies! LOVE your blog! Is there an egg substitute that wouldn’t affect the texture of these? Do you think that a flax egg would work? Thanks! I was just reading through the comments and noticed that you said you can’t eat buckwheat because you eat a primal diet. Like paleo? Buckwheat actually isn’t a “grain”. It’s a pseudograin and a member of the rhubarb family. It is high in protein and is gluten-free. The health benefits are endless! But make sure you get buckwheat groats, not kasha! I hope that helps!! If you still don’t want to use buckwheat flour you can use brown rice or sorghum flour. I love the tips for making these cookies the best. I would have never thought to add Almond Butter- but I’m loving the results. These cookies are so yummy. 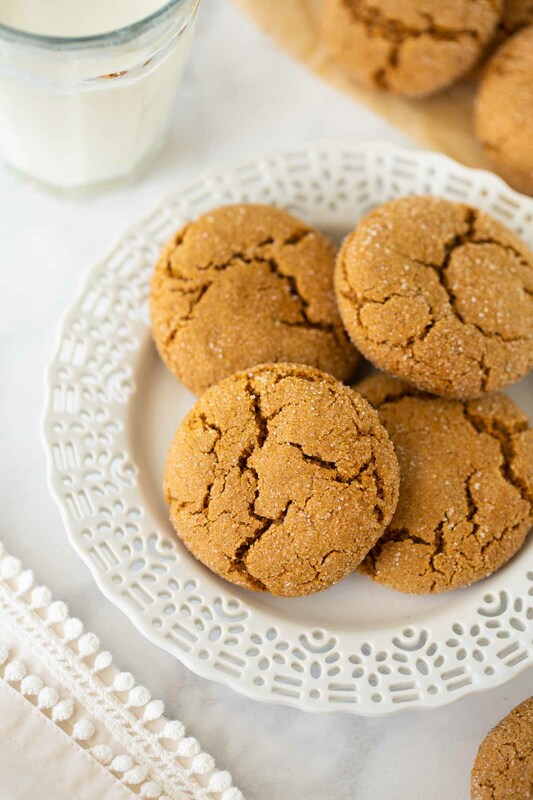 Molasses cookies are my husband’s favorite – made these and they’re SO GOOD! Moist and chewy and really easy to make. Thanks for a great GF recipe. THANKS FOR SHARING!Do they keep long? Hi! Could i sub coconut oil or spectrum shortening for the butter?